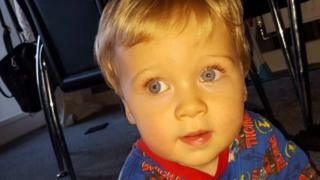 A toddler who died while awaiting surgery for a hernia might still be alive had his operation not been delayed, a hospital chief has said. Kayden Urmston-Bancroft died at the Royal Manchester Children's Hospital two days after a cardiac arrest. A letter from chief executive Sir Michael Deegan read at an inquest said it was likely the 20-month-old would have survived but for care failings. He apologised unreservedly for "this unacceptable lapse of standards". Sir Michael's letter stated: "Were it not for the failings in his care and the delay in the operation to repair Kayden's hernia, it is likely that Kayden would have survived." The trust's recently retired medical director, Prof Robert Pearson, told the coroner many of the recommendations arising from a high-level investigation into the death were being implemented. These included an electronic system to flag up patients who had waited more than 24 hours for an operation, and a system called Tell us Today which allows patients or parents to phone senior managers directly if they believe their concerns are not being heeded by medical staff. The family's legal representative has urged the coroner Angharad Davies, to make a finding of neglect. Previously the hearing has been told that Kayden, from Stockport, had been transferred from Stepping Hill Hospital in the town and placed on a list of patients requiring emergency surgery. There were no beds available in RMCH's high dependency unit (HDU) so he was not able to have the operation, his medical notes said. The inquest resumes on Thursday.